In our modern business landscape with ever-tightening deadlines, RapidMade’s plastic and metal rapid prototyping services allow your business to take designs through more iterations faster and at less cost than ever before. Whether you have a CAD drawing, a sketch or just an idea, we’ll develop the right prototype manufacturing solution for your business. Once we have your design, we’ll ship your fully-functional 3D printed prototypes in as little as one day. If you need a new design from the ground up, you may be interested in our product design and engineering services. We work with a range of 3D printed prototypes—including HP Multi Jet Fusion, FDM, PolyJet, aluminum extrusion, DMLS and SLS—to produce your designs in plastic, metal or composite. We also use 3D printed tooling and molds to quickly create vacuum thermoforming prototypes, urethane casting prototypes and more. 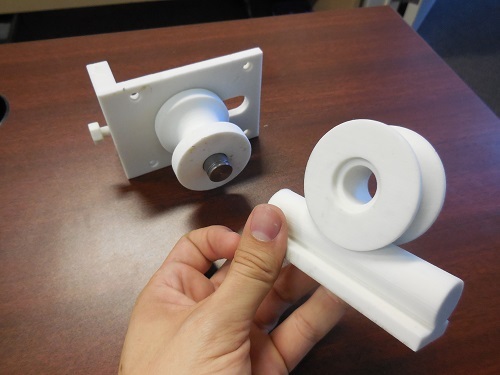 3D printed prototypes are durable, detailed and inexpensive, able to test function as well as form. Because of their excellent resolution on fine detail, they are also a reliable alternative for prototyping traditional manufacturing technologies like injection molding and machining. Whatever the scale of your project, we can help you test your designs. We are experts at working with small budgets and are able to quickly iterate revisions or make several designs at once. In addition to our 3D printing prototype services, we also perform expedited prototype machining or injection molding to get your production up and running as fast as possible. Once your prototype is complete, you can seamlessly move your project into production with our full suite of in-house manufacturing services, saving you time and expense. Since we’ll already have your CAD design ready to go, full-scale production runs are as easy as placing your order. Our experienced engineering team is dedicated to helping you find the best, most streamlined manufacturing solution to give your business the tools it needs to succeed. If you’d like to get started with our 3D rapid prototyping services, use our Get a Quote tool and we’ll get back to you in 24 hours or less with a quote and details about your project.